Congratulations on your admission to Wayne State University. Now what? Follow the checklist below to make sure you're prepared for your first day of classes. Log in to your undergraduate application portal with your AccessID and password to let us know you’re ready to join the Wayne State family. Freshmen admitted for the fall semester will need to pay a $50 enrollment deposit to secure their spot as a Warrior. The free application for Federal Student Aid is your first step when applying for loans, grants or scholarships. Log on to FAFSA and use the WSU school code 002329 when applying. Once you’ve submitted the FAFSA, check your aid status on Academica. You'll meet other new students, get academic advising and register for classes during this mandatory event. Sign up for a session that fits your schedule at orientation. Visit housing and learn how living on campus can offer added convenience and enhance your Wayne State experience by creating a home away from home. Be on the lookout for important information about orientation, housing, financial aid and more. Log in to Wayne Connect. 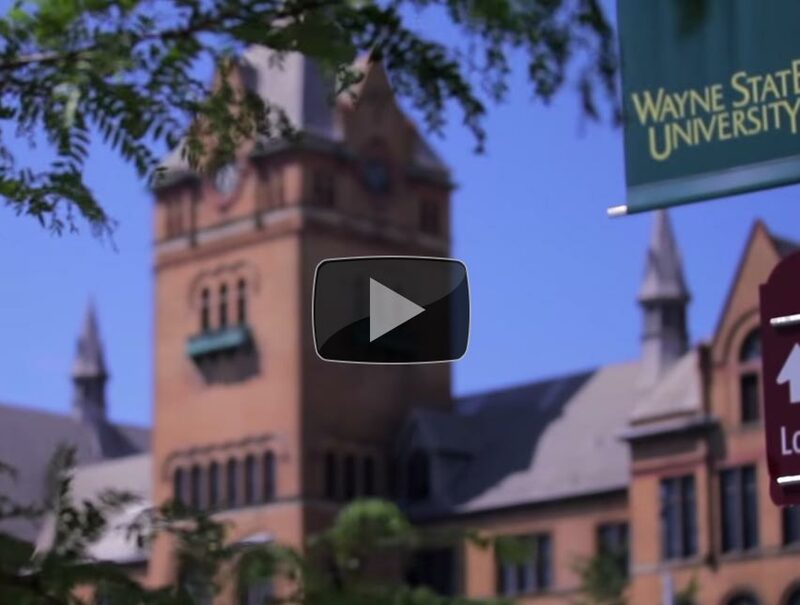 Explore Wayne State’s unique campus in the heart of Detroit online or in person – we know you’ll like what you see. Use one of our custom cover photos on Facebook or Twitter and tell the world you're proud to be a Wayne State Warrior. It is important to connect with your academic advisor as soon as you are admitted. Many transfer students will need to take upper division courses that fill quickly once registration begins. Find your academic advisor or schedule an appointment online as soon as possible. Transfer students admitted for the fall semester will need to pay a $50 enrollment deposit to secure their spot as a Warrior. We will be sending you important information about orientation, housing and financial aid. Log in to Wayne Connect. The Free Application for Federal Student Aid will be available at FAFSA beginning Jan. 1. Use the WSU school code 002329 when applying. You can check your financial aid status on Academica after you apply. You can search and apply for private scholarships by March 31. Log in to Academica using your AccessID and password. Under Student Resources, click on Degree Works. Once you are logged into Degree Works, view your Degree Worksheet, which shows all of your degree requirements. Any transferable credit has been applied to this worksheet. Housing applications will be available in February. Visit housing for more information. During your Warrior Welcome, you will get your student ID, hear from our financial aid office and many other important campus resources that will support your academic success at Wayne State. You will also have the opportunity to have a check-up with your academic advisor if you have any additional questions about your academic plan. Sign up for a session. After reviewing your transfer credit evaluation, determine whether placement exams in English, math, biology or chemistry will be required by visiting the testing website. We recommend taking tests at least two weeks prior to your orientation date. International students admitted for the fall semester will need to pay a $50 enrollment deposit to secure their spot as a Warrior. Check your status and pay the SEVIS fee. The SEVIS fee is $200 USD for F-1 students and $180 USD for J-1 students. Remember to print your receipt, as you will need it at the border. If changes are necessary, email I20unit@wayne.edu. If you have not applied for an I-20/DS-2019, visit the OISS site to learn more about applying for your F-1/F-2 visa or your J-1/J-2 visa. Remember to include all supporting documents. Transfer students should complete the Transfer In Clearance form. Locate the U.S embassy or consulate in your country and follow the instructions provided for applying. Students from all countries except Canada are required to submit an online nonimmigrant visa application (Form I-160) and schedule a visa interview. When you go to your visa interview, bring your SEVIS receipt, WSU admit letter, I-20/DS-2019 form, documents showing financial support and your passport. Canadians may apply for the F-1/J-1 status admission directly at the U.S port of entry. Bring your I-20/DS-2019 form, SEVIS receipt, documents showing financial support and your passport. A cash processing fee of $6 USD will be required when you enter the U.S via bridge or tunnel. Arrive to campus no more than 30 days before the start date on your I-20/DS-2019. Please note that you may not receive your paper form I-94 at the port of entry. If this occurs, visit U.S Borders and Customs to learn how to obtain your I-94 number. You are invited to attend orientation. Choose a date and time that work best for you. Prior to orientation, visit our testing website to determine whether placement exams in English, math or science will be required. You are required to meet the university’s English proficiency requirement, indicated by minimum scores of 79-80 TOEFL IBT and IELTS 6.5. If you do not meet the university English proficiency requirement, you must apply to the university’s English Language Institute. Get detailed instructions on registering and sign up as early as possible. All international students must check in with the Office of International Students and Scholars when they arrive on campus. Sign up for a mandatory New International Student Check-in. Health insurance is mandatory for international students. Visit the student insurance website to enroll and pay for yours. This is a requirement for your duration at Wayne State. Veterans admitted for the fall semester will need to pay a $50 enrollment deposit to secure their spot as a Warrior. The Free Application for Federal Student Aid will be available at fafsa.gov beginning Jan. 1. Use the WSU school code 002329 when applying. You can check your financial aid status on Academica after you apply. You will be notified via WSU email when your evaluation is complete. Log in to Academica using your AccessID and password. Click on the Student tab, then on STARS for degree audit. You can then log in using your AccessID and password and select Transfer/PvEd. You will sit down for a personalized academic advising session and register for classes. Sign up for orientation. WSU must have proof of graduation before you can start classes. Be sure your transcripts are sent to the Undergraduate Admissions office once you have graduated. The GI Bill ® provides educational benefits to veterans and their dependents. You can explore your benefits or contact our Office of Military and Veterans Academic Excellence. We have monthly informational meetings for our new incoming veterans, military, and dependent students.